Absolutely AMAZING photo! These aren’t the kind of creatures I like to run across in person, but photos like this are awesome. It’s a dream of mine to travel to the Galapagos Islands, Ecuador! This is a fantastic wildlife shot. This is really a nice picture. I have never seen this before. Even not on Discovery Channels or Animal Planet. Is this picture made by remote control or telephoto? Magnifique photo, il faudra que tu m’expliques un jour comment tu fais pour améliorer la netteté de ta photo ainsi que la rendre autant lumineuse ( même si la prise de vue doit déjà être géante !) ! En tout cas j’adore ! Bravo ! @Kevin, Bonjour Kevin! merci beaucup. All the processing was done within Adobe PS LightRoom, a wonderful program for photographers. Great shot! I think I found my new screen saver. When I was kid I wanted a Marine Iguana as a pet, such an incredible reptile. Do the crabs clean the Iguanas or was he just passing by? Such a beautiful picture and from one of my favorite places. Galapagos will always hold a special place in my heart. In which of the islands was this photo taken? 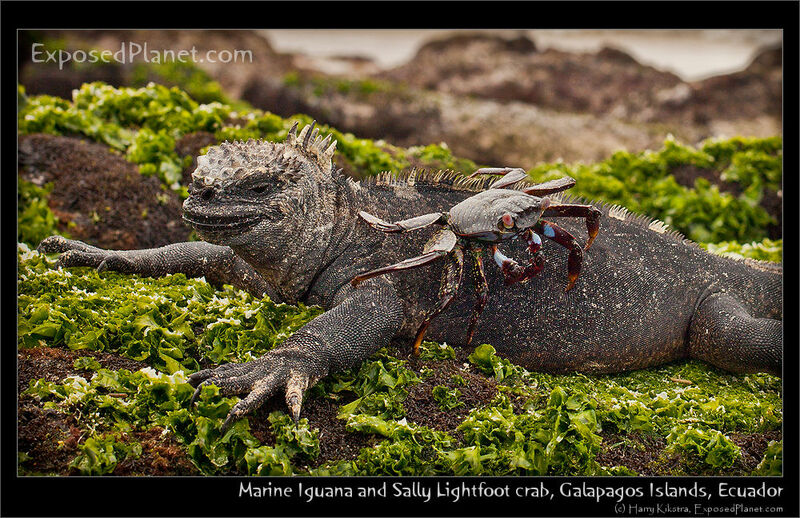 The story behind "Happy 2011 part 2: Amigos from the Galapagos: Can we just be friends?" After the long list of past and present in the previous post, here is a view ahead for all of us, illustrated by these small guys. I loved my visit to the Galapagos, it was truly an old dream come true. We managed to visit the main islands ‘budget style’, so without a cruise, but by island hopping instead, sleeping in $10 hotels, so the flight over was the expensive part. The great thing about staying on shore is that you are not tied to a program and have all the time in the world to just wander the beaches. That is where I saw these 2 guys. Actually, I only noticed the marine iguana and as mentioned they are some of the coolest creatures around, see also the previous Iguana shot from 2 posts ago. But just when I was ready to take a photo, I noticed that one of the millions of small crabs was approaching. This was unexpected as most Sally Lightfot crabs are fast as lightning and react to fast to movements that they seem to have a sixth sense for danger. Not this guy. He came slowly up the rock and then went in a straight to a wet patch. The iguana was directly in his path, but the crab just slowly walked up the side of his head, over the top of it, nearly missing the iguana’s eyes and then down over the side on the other way. With exemplary, textbook cool behaviour, the Iguana did not move a single millimeter and just posed like nothing happened. So if these 2 creatures who are so different can share their ecosystem and even their space and food, maybe we can do so as well? So all you Hutus, Tutsis, Democrats, Republicans, Catholics, Protestants, Sunni, Shia and others with a favourite enemy out there: please think about the above picture for a few moments and accept the differences and the fact that there is only one planet and only one life to enjoy it. Stop the hate and polarisation, that energy is much better used for the good of your fellow creatures right now. I hope that in 2011 everybody gets to travel or at least be outside and and see and respect nature and that you will enjoy the differences and celebrate the similarities with your fellow beings.